Many of you know that I love hearts! I love the shapes and all of the possibilities. This embroidered heart is block #4 from my Stitch Along Sampler Class series. The embroidery stitches include looped feather stitch, chain stitch, blanket stitch, modern fern stitch, Pekinese stitch, straight stitch, whip-stitch rose stitch, spider web rose stitch, lazy daisy with bullion tip stitch, lazy daisy stitch, French knot stitch, Colonial knot stitch, Chinese knot stitch and stacked bead stitch. Here is a group of the embroidery samplers that will be made in the series of classes called The Embroidery Corner. This group covers the traditional stitches. This cute little rug is adapted from a vintage technique that started in the 1800’s, where scraps of wool from blankets or clothing were cut out using a penny or circular template (hence the name). These round sections were then stitched with the blanket stitch, often with a penny in the middle to keep the fabric flat. This decorative piece can be used as a small table or dresser matte. It is made from simple ingredients, and easy embroidery stitches. Date and time: This class is not currently on the schedule. I just finished another sampler for the Renaissance of Ribbon Embroidery class that I teach. This is one of the classes that I have been teaching for over 25 years. Silk ribbon embroidery continues to be one of my favorite forms of embroidery. This is an excellent class to learn about the joy of hand embroidery with silk ribbon. Basic stitches and more will be covered in class, referring to the directions in my book Embroidered and Embellished. 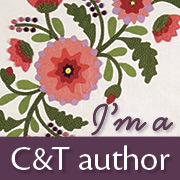 Class Fee: $45.00/the customer must also have a copy of Embroidered and Embellished by Christen Brown. Class Requirements: Hand embroidery skills a must. This class fee is paid directly to Christen. This can be paid by a PayPal invoice, or by check and sent to Christen. Please email Christen: thestoreonthecorner@gmail.com with your inquiries. Once the class is paid for the supply list will be sent to the customer’s email address. If you are a cat lover, this cuddly felt cat is your guy! 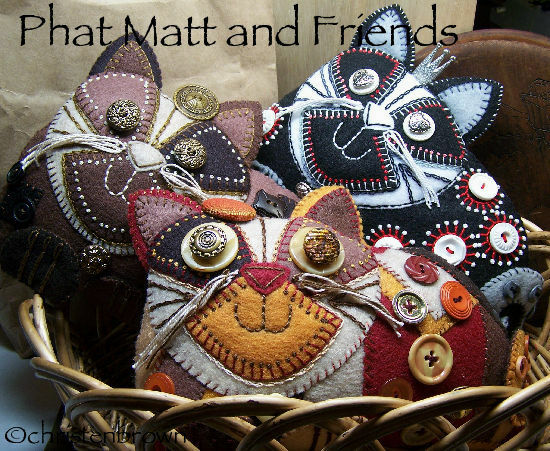 Matt is made from three or four colors of felt, adorned with a few embroidery stitches and buttons. This is a great simple project that can be completed in a few days, or over a weekend. The colors that you choose can be life-like or more contemporary, matching a theme or your décor. Whatever you choose, you can’t go wrong with this friendly guy. Skill Level Intermediate: hand sewing and embroidery knowledge needed. Lesson 1: In this class you will choose your colors for the different body components, and then cut out the pattern pieces. Directions for the embroidery stitches will be covered. 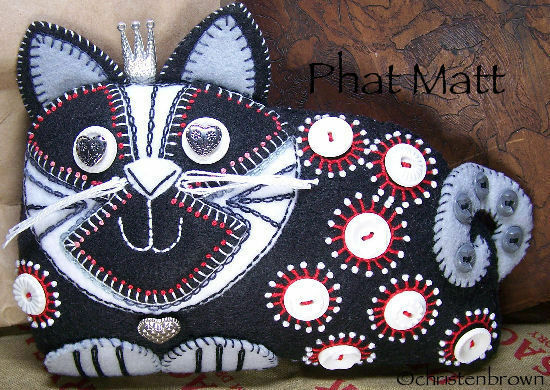 Then you will embroider the face of your cat, adding in the all-important whiskers. Lesson 2: In this class you will embroider the small body components such as the ears, paws and tail. Then you will attach the face to the body, and finish off the body with buttons and more embroidery. Directions for final assembly will follow, and then you can cuddle your cat to your hearts desire.